Best of 2015: Eclectic – The global community for audio culture. Here we celebrate the shows the span a range of genres, crate diggers who might play you funk one minute, disco the next and grime after that. 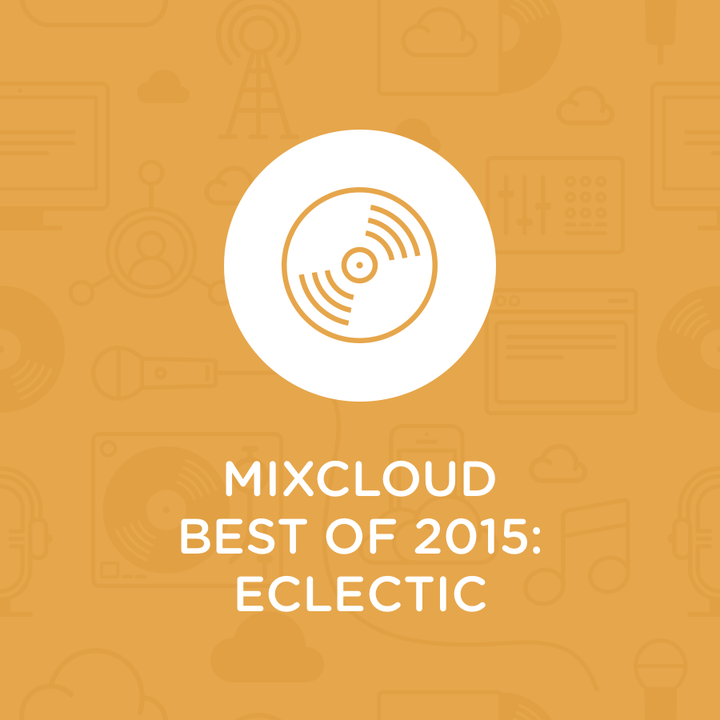 We present to you Mixcloud Best of 2015: Eclectic. DJ Dimsa places himself as a unique phenomenon representing a very new direction in international DJing, as represented in his Living Lounge show. He poses the questions: Bedroom DJ or Professional? Lounge or Deep House DJ? A pioneer of the Internet DJ or a leader for the new breed of Social Media DJs? And provides the answer: All of the above and none of them at the same time. DJ Dimsa distinguishes himself from DJs who specialise in one sound, he takes the road less travelled and leverages his almost 30 years of musical background to create an eclectic experience. Dimsa is an Original Lounge Crusader. He has a mission, the LOUNGE mission: to share his moods, whether it’s a beachside cafe or cluster of poolside cabanas in Mallorca, Spain or an ultra-chic and hip lounge in the Bay Area around San Francisco. Massimiliano Conti (from Pescara, Italy) a.k.a. Jazzcat is a true passionate music lover and DJ. In the early 80s he started to collect records, covering various styles and genres with a focus on american black music, and at the age of 20 he started DJing in local radio stations and small clubs. Soon he discovered his passion for jazz music, his biggest influence. In September 2010 Massimiliano joined Mixcloud where he’s remained very active and can now boast more than 350 mixes uploaded in 5 years, spinning the very best in classic and modern Jazz, Soul, Funk, Latin, Afro and Brazilian music. During this time he has collaborated with DJs, artists and radio stations around the globe and recently his Mixcloud page reached 73.000 followers. According to his profile he’s not a DJ per se or someone with a musical ego, just an eclectic listener and purveyor of good music. Hosting some of the best vintage and rare 70s, 80s, soul, jazz, funk, disco, reggae, rare and classic LPs and Mixtapes. Each show has a theme such as ‘Samples’ or vibe such as ‘Late Feelings’ and each promises the treats only a true crate digger can offer. Malibu Play is the soundtrack to the #BestSummerEver. Every month Malibu Rum invite their favourite DJs to create a totally original new mix packed full of audio goodness to help you get your party started. Curators have included Monki, Clean Bandit and Eton Messy. Browse their shows for the full summer feeling. One the most important tastemakers Europe has to offer and described by Fact! Magazine as “your favourite DJ’s favourite DJ”, LeFto is also affiliated with Brownswood Recordings, Blue Note, Universal, Heavenly Sweetness and BBE. Hailing from Brussels, Belgium, his knowledge of music and access to the freshest tunes makes every show a must listen. LeFto has been an exemplary uploader to Mixcloud for years and is a valued member of the Mixcloud community.